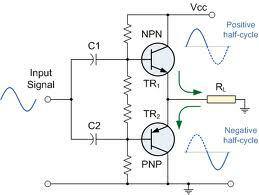 Unlike the Class A amplifier mode of operation above that uses a single transistor for its output power stage, the Class B Amplifier uses two complimentary transistors (an NPN and a PNP) for each half of the output waveform. One transistor conducts for one-half of the signal waveform while the other conducts for the other or opposite half of the signal waveform. This means that each transistor spends half of its time in the active region and half its time in the cut-off region thereby amplifying only 50% of the input signal. It is twice as efficient as class A amplifiers with a maximum theoretical efficiency of about 70% because the amplifying device only conducts (and uses power) for half of the input signal.